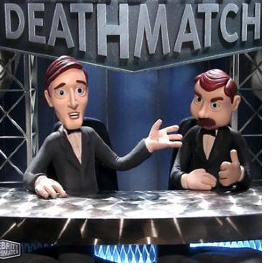 Here on Career Death Match, you've previously seen some of the fiercest rivals go head to head in a duel to the death. Last season, you saw McDonald’s tear Burger King a new orifice, Hooters smother Applebee’s, and General Dynamics bomb the bejeezus out of Lockheed Martin. But you've never seen anything like the battle you're about to witness today. In an unprecedented industry-crossover Career Death Match, the investment bank that everybody loves to hate as of late, Goldman Sachs, will take on the strategy-savvy super men and women of the uber-elite and iconic management consulting firm, McKinsey & Company. We expect the fight between these often respected, often spit upon, frequently deemed to be extremely arrogant and overpaid firms to be fair and (the way we like it on Career Death Match) very dirty. The contenders are entering the ring now. Let the match begin. McKinsey: "Ivory tower intellectuals"; "CEO academy"; "arrogant firm, arrogant people"; "gold standard, but not invincible"
McKinsey & Co.: "Rigorous but fair"; "no surprises and no tricks"; "provides case coaches before each round of interviewing: very helpful!" Goldman Sachs: "At very high levels, they’re personable, supportive and outwardly take active interests in junior issues and development, but quality of lower-ranking managers varies"
McKinsey & Co.: "Surprisingly supportive, warm and welcoming"
McKinsey & Co.: "Ideas; fun; people who go out of their way to help each other be successful"
McKinsey & Co.: "The range is extreme, depending on the study; certainly, some studies are very manageable, but others make it difficult to meet personal commitments"
Did Ernst & Young Help Lehman Brothers Broil Its Books?